This is an activity to practice going back and forth between the different tenses. 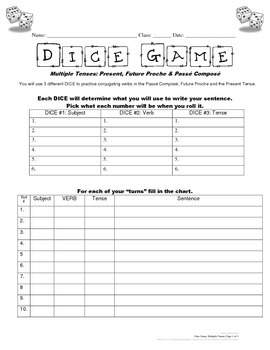 Teachers will need dice for the students to use in pairs or groups. 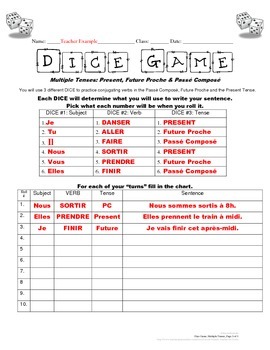 With a partner, students use dice to choose what will be used in each sentence. EX: subject pronoun, verb and tense. Then students write their own sentence using the elements. Once I introduced this activity in my class, students began to understand and see the contrast between tenses. Things really began to click for my students. They liked the repetition and seeing all the different tenses next to each other. This is a challenging but helpful activity.